The standard procedure in the past for sewer pipe repair required digging trenches. It used to be essential for reaching through to the faulty pipes for repairing them. However, gone are the days when such destruction was necessary because our team at Lining Coating Solutions relies on the latest technology to devise advanced and environmentally friendly methods for sewer pipe repair. Sewer repair technology in its latest and most advanced form is what we prefer to use. It has completely removed the need to damage properties in order to access the pipes that need to be repaired. Leaving behind the minimum possible traces of repairing procedure, sewer pipe repair is effective as well as efficient. Its various advantages make it a superior repairing procedure that is convenient for the residents of St. Petersburg. 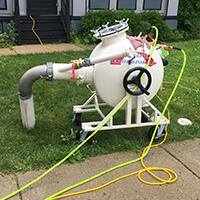 Our technicians and engineers at Lining Coating Solutions are skilled professionals who are very familiar with the latest aspects of sewer repair technology. This knowledge allows them to employ this convenient and powerful advancement of technology in the best way possible. With a certification in sewer pipe repairs and technology, we ensure all of our customers that the problem will be resolved quickly and that there will be no need to relocate or experience any major downtime during our visit. In addition, this technology counters the need of buying new pipe systems and hardware, making the process much smoother while also saving our customers time and money. The first step of our sewer pipe repair procedure includes a waterproof camera inspection. We run through the camera via an access point for thoroughly examining the insides of the pipes. This results in a real-time video on a portable screen helping us point out the faults inside the pipes. This way, our expert workers will recommend the best repair method based on the overall condition and quality of the existing pipelines. Our equipment and technology allow us to inspect pipes of around 200-inch diameter that are up to 1,500 feet in length, allowing us to easily cover any section of your pipelines. Once the problem with your sewer pipes has been identified, we make use of our cured-in-place pipe lining method to fix the pipes. This is a no-dig method that involves the insertion of an epoxy liner inside the faulty pipe. Using the inflatable liner, the epoxy material is pressed on the inner sides of the pipers. This material seals cracks and fixes the pipe as a new pipe is built into the older one. The process reduces the mess that was previously a collateral for fixing pipes, making it a simple, fast, and efficient. At Lining Coating Solutions, we have the most advanced technology and skilled workers know how to handle the task of sewer pipe repair in the best possible manner. If you are the residents of St. Petersburg, Florida and your sewer pipes are in need of fixing by the professionals, then Lining Coating Solutions is your best option. Contact us now at 888.345.5112 and schedule a visit.